The Green Eyed Envy Monster is no stranger to the fertility challenged. 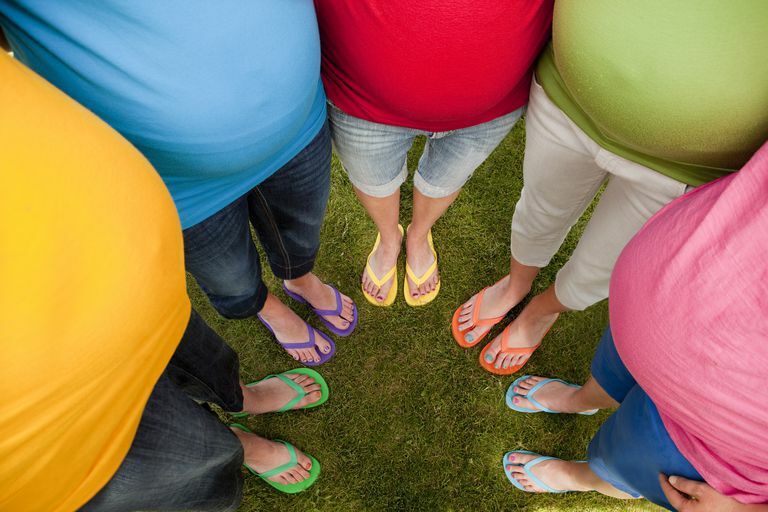 Feeling pregnancy envy over friends, co-workers, and relatives is normal and common. You may even feel jealous just seeing a stranger's pregnant belly! What causes envy? And how can you cope? Envy is a normal emotion. You're not a bad person, friend, or relative for feeling pangs of jealousy. Understanding the underlying thoughts that feed into jealous feelings may help you understand yourself better and even reduce these uncomfortable feelings. Common Jealousy Rational #1: "I would be a much better parent, but Ms. Terrible-Mother gets pregnant yet again." Why do women get pregnant who were "not even trying?" Why does your co-worker become accidentally pregnant when you can't purposefully get pregnant for months or years now? Why is your neighbor—who you believe to be a terrible mother—able to pop out kids with ease, but you—who you believe would be an awesome mother—can't conceive no matter how hard you try? The truth is that pregnancy doesn't discriminate. Becoming pregnant is not dependent on how "hard" you try, nor on whether you'd make a good parent or a bad one. Common Jealousy Rational #2: "How dare she complain! She has no idea how lucky she is." Nothing stirs up jealousy and anger more than when a lucky friend starts complaining about morning sickness. Or having to wake up with the baby in the middle of the night. How dare she complain when you would give everything to have a baby? Well, here's the thing to keep in mind: When you're pregnant, you'll also probably want to complain. If you force yourself to keep a happy appearance on the outside throughout pregnancy and the postpartum period, you may set yourself up for feeling depressed. Pregnancy and early parenthood aren't easy. Keeping your struggles a secret isn't good for your mental health. In fact, having experienced infertility puts you at a higher risk for developing postpartum depression. When you hear your friend complaining, remember that whining about pregnancy and the newborn period is also part of the experience. It's not that they don't appreciate what they have—they do. They just also love to talk-it-up. Also, remember that pregnancy and new motherhood are a both a blessing and a difficult experience to go through. Complaining isn't a sign they don't appreciate it—it's part of the reality of pregnancy and parenting. Common Jealousy Rational #3: "Why her and not me?" There are two rationales behind this one. One is a kind of silly notion that pregnancies are in short supply. Almost like if all your friends get pregnant, there won't be enough "pregnant" to go around for you. This isn't true, of course. The other rational behind this one is more accurately, "Why not me?" It's the sadness peaking out from behind the jealousy. In many ways, it is easier to feel envy and direct your difficult feelings outward than to look inward and acknowledge sadness. Jealousy is less about your friend or family member's pregnancy, and more about your own grief over infertility. Infertility is a frustrating, difficult disease to face. Feeling sadness, anger, grief, and fear is common and normal. Anger especially is an emotion that likes a target. If you're feeling angry about infertility, directing that anger at a co-worker who gets pregnant may feel easier than directing it at the universe for not dealing you the pregnancy cards you hoped for. When you're in the thick of pregnancy jealousy, sometimes you need to take steps to lessen your exposure to the triggers. Hide/unfollow all status messages on Facebook from your pregnant friend or family member: They'll never know you hid their updates, and you can always go to their page every so often and scan for important updates. Plus, if something really important happens, they or someone else will tell you. Decline the baby shower invite: You really don't have to go. Honest. Ask them not to talk about pregnancy all the time: If hearing them talk about the pregnancy is painful, either find a way to switch the subject, or be honest and tell them you don't want to talk about the pregnancy and why. "I am happy for you, but hearing you talk about your pregnancy makes me feel extremely sad because I can't get pregnant myself. So can we talk about the things we spoke about before you got pregnant?" You may need to re-let go over and over again. But being able to do so is important to your mental health. There comes a time when isolating yourself to avoid pregnancy jealousy will create more harm than good. Letting go of pregnancy jealousy takes time, and sometimes, you need professional counseling to help you get there. As stated above, jealousy is deep down grief and anger. If you don't face the inner sadness, you'll have a harder time letting go of jealousy. Tell someone: Don't keep your feelings a secret, otherwise they fester and grow larger. If your pregnant friend or sister is close to you, you can confide in them. If not, talk to someone else who will understand. A counselor can serve in this role as well. Write out your sorrows: Write in a fertility blog; write a letter than you'll never send to your pregnant friend. (Or write one that you will send, expressing how you want to be happy for her but the sadness of your own situation makes that difficult.) Write in a private journal. Write out what you cannot say. Send a blessing or prayer: When your eyes gaze upon a pregnant belly, and you feel the green jealousy monster rising inside, pay attention to that feeling. Take two deep breaths. Then, close your eyes and send blessings, vibes, or prayers to that mother and baby. The prayer can be very simple, like "May you have a healthy, safe delivery; may you know nothing but love and warmth." Do this when you feel like giving a blessing, and do it when you don't. Then, after sending the blessing to the pregnant woman, send a blessing to yourself, fertility related or not. Like, "May I have peace, may I have love," or "May I soon know what it's like to carry a child." Don't be surprised if you feel the jealousy melt away into tears of sadness. Try to let go of shame and guilt for your feelings: The only thing worse than feeling bad is feeling bad about feeling bad. Pregnancy envy is common. You are not the first, and you won't be the last, to hear about a friend or family member who has conceived and get upset. When you sense yourself getting angry with yourself for feeling envious, or for not being able to feel joy for your friend, try saying to yourself, "I'm feeling envious. This is normal. I forgive myself." When you've been struggling to get pregnant, envy of someone's pregnancy or newborn baby is normal. You are not a bad person for feeling this way. It's not that you're not happy for your friend or relative. It's that you're feeling sad for your loss. Beating yourself up over your very normal reaction isn't worthwhile. The best way to cope with pregnancy envy is to accept that your feelings are normal, forgive yourself for feeling upset, and reach out for support. Be sure your support person will understand your perspective. The person you're envious of may not be the best one to talk to. If you can't get over your feelings of envy, or they are interfering with your ability to enjoy your every day life, consider counseling. There are many good reasons to see a counselor during infertility. They can help you deal with all the other difficult emotions that arise during fertility challenges.